The Kepler mission has already made history by announcing the discovery of 33 confirmed planets, including the two Earth-size planets in the Kepler-20 system and the 2.4 Earth radius planet in the habitable zone of Kepler-22. In this paper, Kipping et al. describe an exciting new project called HEK (The Hunt for Exomoons with Kepler) to search for moons orbiting the planets around the Kepler target stars. If they find moons at the right temperature, then Kipping et al. will be able to announce the first discovery of a potentially habitable moon orbiting a planet around another star. Although habitable moons are common in science fiction, astronomers have not yet detected any moons (habitable or not) in other planetary systems. The lack of known exomoons is partially due to the inherent difficulty of detecting a moon orbiting a planet in another stellar system and partially due to the fact that astronomers have not yet conducted a careful search for exomoons. Now that the Kepler team has announced a list of 2326 candidate planets (dramatically increasing the number of potential exomoon hosts) and released an exquisite database of light curves (plots of stellar brightness versus time that might contain periodic dips caused by a planet passing between the star and the observer), Kipping et al. declare that the time is ripe to search for exomoons. In a previous paper, Kipping et al. demonstrated that Kepler data should reveal the presence of moons with masses of approximately 0.2 Earth masses or larger. For comparison, the Moon has a mass of 0.0123 Earth masses, Jupiter’s moon Ganymede is 0.025 Earth masses, and Saturn’s moon Titan is 0.0225 Earth masses. Since the putative exomoons that could be detected by Kepler are ten times more massive than Ganymede, they represent a class of objects that are not present in the solar system. However, the lack of “large moons” in our solar system does not mean that these objects cannot exist in other systems. The discoveries of hot Jupiters (gas giants orbiting very close to their host stars) and Super-Earths have already demonstrated that the solar system contains only a subset of the many types of worlds in the universe. Galileo image of Ganymede. The exomoons that could be detected by Kepler are ten times more massive. Despite the lack of large moons in our solar system, dynamical simulations demonstrate that Earth-mass objects could be captured into orbit around a gas giant. Although some moons would enter into unstable orbits and would later escape the system, roughly 50% of the captured moons should remain in orbit. As time passes, the orbits of those moons will circularize due to tidal torques from the host planet and the moon will migrate inward or outward from the star as it becomes tidally locked (meaning that one face of the moon always faces the planet and that the moon’s day has the same length as its year). Depending on the initial post-capture orbital configuration, some of the moons may migrate too close to the star and be ripped apart to form a ring system. Other moons might migrate so far outward that they escape the planet and leave the system. In either case, astronomers only have a finite window of time to observe the moon before it is destroyed or leaves the system. Kipping et al. use estimates of the planet candidate masses (based on the radii measured by Kepler and assumptions about bulk density) and orbital parameters to calculate the expected survivability of exomoons in each system and focus their search on the planet candidates that are most likely to host moons. They also examine planet candidates around stars with interesting light curves that may indicate the presence of a perturbing body (either an additional planet or an exomoon). For each of their candidate exomoon systems, Kipping et al. perform a systematic analysis of the light curves of the target stars to determine whether light curve models including an exomoon produce a better fit to the data than models without an exomoon. Assuming that a planetary system does host an exomoon, the gravitational influence of the exomoon on the planet should alter the timing of planetary transits because the planet will be orbiting the barycenter of the planet-moon system. As shown in the figure below, the periodic motion of the planet will induce transit timing variations (TTVs) as the observed transit occurs earlier or later than the time predicted for a planet without a moon. However, there are multiple reasons why TTVs might be observed in a planetary system, so the presence of TTVs does not necessarily imply that a planet hosts a moon. One alternative explanation is that the transiting planet is being gravitationally perturbed by another planet in the system. A cartoon explaining why a moon would induce a transit timing variation. A planet with moon orbits the barycenter of the planet-moon system, so the planet is in a different position in orbit B compared to orbit A. The shift in position induces a variation in the transit time. The presence of a moon should also induce variations in the duration of a planetary transit due to the change in the projected velocity of the planet caused by its orbit around the planet-moon barycenter. While TTVs should be strongest for moons at large distances from their host planets, the velocity inducted transit duration variations (TDV-V) should be strongest for close-in moons. The combination of TTVs and TDV-Vs is a strong signature of a perturbing exomoon and would allow astronomers to uniquely determine the mass of the moon and the separation between the moon and planet. However, astronomers also have to account for the change in transit duration due to the change in the transit impact parameter (the distance between the projection of the planet on the star and the center of the star) caused by the planet’s orbital motion about the planet-moon barycenter. The two separate transit duration variations due to the change in the planet’s velocity and transit impact parameter add together to produce a global transit duration variation. If astronomers are able to untangle the transit timing variations and the transit duration varations, then they can determine the moon mass, moon-planet separation, and (for high signal-to-noise cases) the direction of the moon’s orbit around the planet. In addition to changing the timing and duration of planetary transits, the exomoon might also cause additional dips in the light curve as it transits the host star. If the moon and planet transit separately, then the shallower dips due to the moon blocking light from the star are known as “auxiliary transits.” If the moon is in a close-in orbit, it is more likely to participate in a “mutual event” in which the star is blocked either by both the moon and planet or by only the planet while the moon is in front of or behind the planet. Both mutual events and auxiliary transits allow astronomers to determine the radius of the exomoon. By combining radius information from the light curve with mass information from transit timing and duration variations, astronomers can then reconstruct the densities of the moon and planet. Since the radius of the planet is already known from the light curve, astronomers also recover the mass of the planet without having to conduct radial velocity observations. Finding exomoons in the Kepler data will require a complicated analysis that compares the observed light curves, transit times, and transit durations to those expected from models of various planet-moon systems. Kipping et al. has already developed the LUNA algorithm to generate simulated light curves that fully account for all of the dynamical effects and they are prepared to implement LUNA in a Bayesian fashion to determine the likelihood that each planet candidate hosts an exomoon. 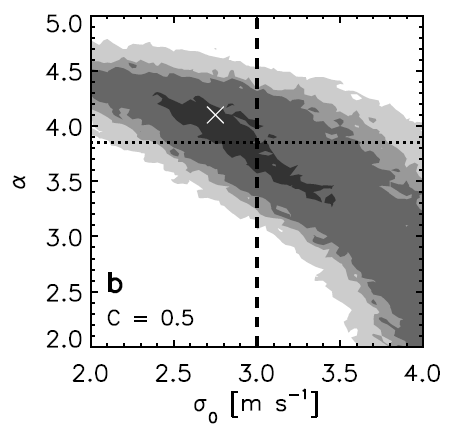 For systems without detected moons, Kipping et al. will place an upper limit on the mass and radius for a moon to remain undetected. Next, Kipping et al. will combine the results for each planetary system to estimate the frequency of large moons and determine whether the scores of fictional exomoons will soon be joined by actual worlds. An artist's conception of the view from an exomoon. 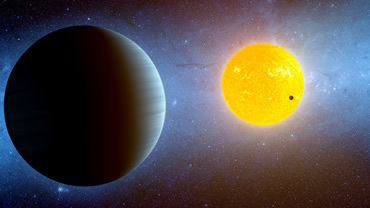 Super-Earths or Mini-Neptunes? Super-Earths or Mini-Neptunes: Part Two Kepler-10c: A Newly Validated Kepler Planet in a Multiple System Lonely No More: Do Other Planets and Exomoons Keep Hot Jupiters Company? hello there. I came across your blog while doing research for a sci-fi story I plan on writing. I like hard science fiction and want to get my facts straight. I found your post helpful in this regard. You state that stable capture is 50%, however it is my layman’s understanding that capture is very unlikely in the first place and would require a three body interaction like what is theorized to have occurred with Triton. Just curious as to your thoughts on this.